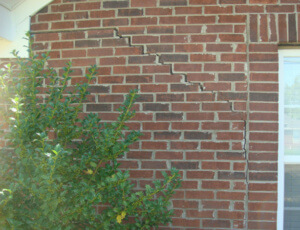 Differential Settlement can be simply defined as “unequal settling of a building’s foundation.” Differential Settlement can result in damage to a building, leaving small and/or large gaping cracks in exterior brick veneer and concrete blocks. 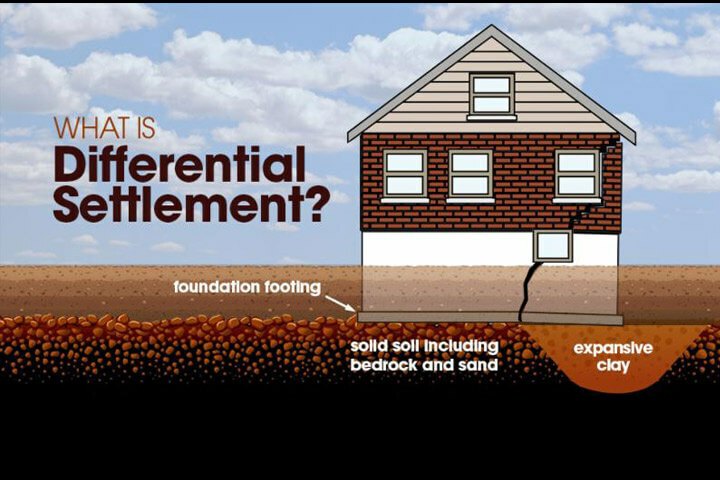 To gain a better understanding of how differential settlement occurs, let’s first review how a foundation is laid. All houses are founded on some type of foundation: typically a slab, crawl space or basement. 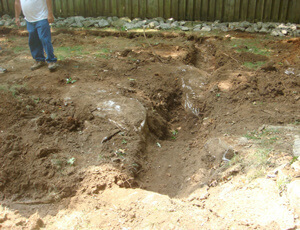 All foundations, including slabs, have a perimeter buried footing. The Building Code in Huntsville says this footing shall consist of cast-in-place concrete, that is at least 12-inches thick, two-feet wide, and continuously reinforced with two (2) pieces of 5/8-inch diameter steel rebar. No matter how sturdy this footing may be, though, Differential Settlement can still occur depending on what lies directly beneath the footing. When bedrock intercepts footing trenches, as in photo above, the bedrock is incorporated into the foundation, which can lead to possible future differential settlement. In some geologic settings, such as the mountainsides of Huntsville, it is sometimes impossible to dig through the soil to cast a trench footing because of outcropped or shallow bedrock. It’s not unusual, therefore, that houses in this setting rest partly on bedrock and partly on soil. The soil will naturally give and settle under the weight of the home over time, whereas the rock provides unyielding support. Over a prolonged period of time Differential Settlement will likely occur, as the portion of the foundation supported by soil gives way and the portion supported by bedrock stays stationary. What further compounds the problem of Differential Settlement is the predominately massive clay soil that exists in this geologic setting. It is like a sponge. It imbibes water and swells in volume. It gives off water and shrinks in volume. Some soils do this “mildly” and some “severely.” These later soils are called expansive clays and they can play havoc on a home. Why? Because Huntsville has cold, rainy winters/springs and hot, dry summer/fall months. If your footing is only located 12-inches beneath the ground surface, and the subsoil dries or desiccates to a depth of four feet; for example, during an extended drought, the footing is going to move downward in proportion to the depth of drying. All of the continuous rebar in the footing is not going to stop this! Diagonal stair-step cracks in brick veneer are a tell-tale sign of differential settlement. So if a house sits on bedrock and expansive clay, then the owner must accept the fact that his/her house is going to move and shift each and every year—simply due to soil volume change with seasonal weather change-unless he underpins the soil supported sections of foundation. If he underpins them, then when the soil shrinks each summer/fall, the steel or concrete pilings provide non-yielding support—just like the bedrock and so the house goes nowhere. When Differential Settlement occurs it can be characterized by stair-step crack patterns in brick and block in the exterior of the home. It may also result in diagonal drywall cracks above/below windows and above doors on the interior of the home. How do I Know If I Should Underpin? Well it’s pretty simple: What are you willing to live with? If you’ve only got one inch of differential settlement and there are cracks in the brick veneer but none inside the home, and you understand that brick veneer is a very brittle material and only a “veneer”, and you can live with the cracks, then the answer is: you do nothing. Maybe point the cracks to make them less noticeable. But if you’ve got large brick veneer cracks and accompanying drywall cracks opposite the brick cracks inside the home, then you’ve very likely got similar cracks in the foundation wall and therefore, significant differential movement has occurred in a localized area. In this case, by all means, implement a foundation repair if you can afford to do so. But don’t mortgage the farm. Get an engineering opinion on what needs to be done, have the engineer develop a repair plan, then give the repair plan to three different contractors for competitive bids. Otherwise, you’re likely to get three completely different proposals for repair. I see this happen all the time. Fortunately, differential settlement is more often so slight that the drywall inside the home never cracks. This means the differential settlement is insignificant and has not adversely affected the wood frame superstructure. So never ever demand or allow that foundation underpinning repairs be made due to cracks in exterior brick veneer when there are no cracks in the interior drywall opposite the brick veneer cracks. Call us to book an Inspection at 256-318-0982 or contact us today!